Ras Al Khaimah: A driver was arrested recently at Al Darah border, the UAE’s northern crossing with Oman, as he attempted to smuggle in 12 houbara bustards. 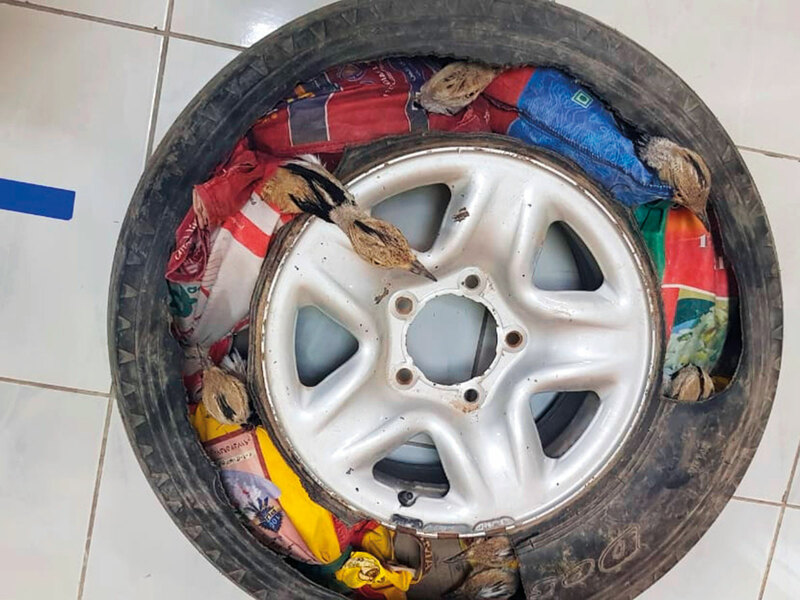 Concealed in the spare tyre of his vehicle and covered with a bag of rice, Ras Al Khaimah Customs officials posted at the border busted the smuggling attempt after finding the driver’s behaviour suspicious. According to a RAK Customs official, the officers on duty grew suspicious when they saw the spare tyre covered by a sack of rice and asked the driver to show what was in the tyre. The driver was hesitant. The officers arrested the man. Director General of the Ras Al Khaimah Customs Department, Mohammad Al Mehrazi praised the vigilance of the customs inspection officers at the gate and their professionalism in dealing with the case. He commended the efforts of officers who prevented the smuggling attempt. Transportation of birds are subject to the approvals of the authorities concerned and restrictions are placed to protect the environment of the UAE. The houbaras are among Cites-listed birds and some of these birds may carry diseases that could lead to the damage of the environment. Al Mehrazi said that the department is keen to develop its cadres, especially the technical staff represented by the customs inspection officers. He added that officers undergo training programmes in body language and customs inspection and the use of advanced devices to detect smugglers and illegal material. Listed by the International Union for the Conservation of Nature (IUCN) as a ‘vulnerable’ species at high risk of extinction, houbara bustards are hunted and trafficked as its meat is considered an aphrodisiac. Similar to a turkey, houbaras are found in arid habitats in North Africa and southwestern Asia. According to IUCN, it is threatened by hunting and trapping around its wintering grounds, with an estimated 100,000 birds surviving in the wild and the numbers are dwindling fast. The UAE has played an active role in houbara conservation since 1977 with a conservation programme in Al Ain Zoo. The efforts were scaled up with the launch of the International Fund for Houbara Conservation, a non-profit organisation supported by the government of Abu Dhabi.